The added configurations above didn’t resolve the issue in any way so I removed them. As the forum thread progressed, some individuals recommended using the VMware View provided GPO templates. Taking a look in the directory c:\Program Files\VMware\VMware View\Server\extras\GroupPolicyFiles\ on the View Connection Server, I found several Active Directory Group Policy templates. The required policy can be found in the pcoip.adm template. 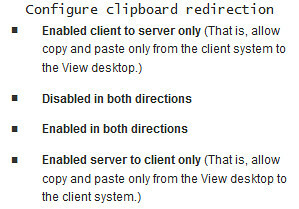 It’s called Configure clipboard redirection (note that for this to work, virtual channels must not be disabled. You can read more about View PCoIP General Session Variables here). I configured the policy for Enabled in both directions and applied the computer portion of the policy to the OU where the VDI session computer account object lives (I disabled the user portion of the GPO). After forcing GPO updates on the VDI session and reconnecting a few times, copy/paste still didn’t work from the VDI session to my desktop PC. It wasn’t until after a reboot of the VDI session that the policy took effect and copy/paste worked bidirectionally. Special thanks goes out to the community members who helped me get this sorted: wponder, srodenburg, SrinivasM, cmarkus, and Linjo. You and all of the others who make up the VMTN Community are an asset to VMware and to those seeking assistance. The clipboard setting exists it two areas in that GPO template- “Overridable Administrator Defaults” and Non-Overridable Administrator Settings”. What’s the difference between these two?